Picture it: An outdoor ice rink during the summer in Los Alamos, New Mexico, is full of fans of all ages who excitedly await the announcer’s call. Women clad in helmets, kneepads and roller skates take to the rink, introduced with names like Nacho Lover, Acute Pain and Bonefide Trouble. As they race around, taking and making hits, getting back up and cheering each other on, the crowd goes wild. This is roller derby! And that’s right; TeamSnap supports this sport. The Los Alamos Derby Dames is one of hundreds of thousands of teams who use TeamSnap to help organize their practices, matches, meetings and more. 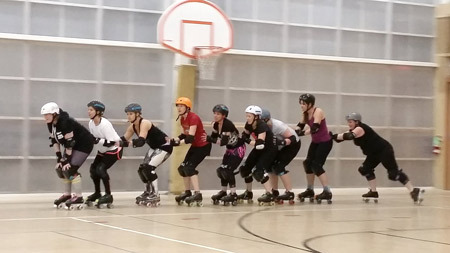 In roller derby, two teams of five skate around a track scoring points during “jams,” in which one member from each team (the jammer) attempts to lap members of the opposing team while the others try to stop her. It’s a full-contact sport played primarily by women and is known for its “do it yourself” spirit. The Los Alamos Derby Dames have been around since 2011. With a dozen skaters, a handful of officials and coaches, and with an additional volunteer youth league of women age 9 to 18 to wrangle, Brandi Engeman has her work cut out for her as a player, coach and president of the group’s board of directors. Organizing the team more efficiently helps save Engeman and the rest of the athletes time, allowing them to concentrate more fully on their sport. Although there are still some leftover stereotypes from the 70s and 80s, when the theatrics overpowered the athleticism of the sport, today’s roller derby is a different breed. Stephanie Myers is the Content Manager for TeamSnap, managing such content as this blog, the TeamSnap newsletter and much more. When she’s not being the boss of content, you can find Stephanie playing rec-league softball or competitive skee-ball in Austin, Texas.